I suggest a process that can generate the answer. In his letter to Post employees, Bezos said "There is no map" -- but I suggest this process provides a map -- it may be crude and in need of some correction, like early maps of "The New World" but, like them, it is good enough to start a journey in the right direction, even if that journey may take some unexpected turns. The Post is famous for its investigative journalism. It pours energy and investment and sweat and dollars into uncovering important stories. And then a bunch of Web sites summarize that [work] in about four minutes and readers can access that news for free. One question is, how do you make a living in that kind of environment? If you can’t, it’s difficult to put the right resources behind it. . . . Even behind a paywall [digital subscription], Web sites can summarize your work and make it available for free. From a reader point of view, the reader has to ask, "Why should I pay you for all that journalistic effort when I can get it for 'free' from another site?" We ask you to pay only what you think fair for the value we provide you -- isn't that fair? The quality journalism we provide is expensive to produce, and if people like you who value it do not pay a fair price, how can we continue to provide it? We will treat you as an individual patron -- we will listen carefully to what you want, and you will get our best efforts to produce and deliver it to you. The answer is an individual one. It will vary from person to person, from day to day. Finding that answer requires an ongoing, individualized process. It also requires individualized pricing, a concept that is challenging as well. This is a problem that was made difficult by the Internet, as Bezos observes, but it is also a problem that can now be solved using methods enabled by the Internet. The answer must be individualized to pin down what value The Post actually delivers to me. It must structure a dialog to learn what I think The Post is worth to me -- and to help frame my evaluation to fully appreciate the value I receive. It must close the loop to drive toward a fair exchange between me and The Post over time. The first cycles of this dialog may give poor results, but with good feedback and direction, this can drive an emergent process that delivers value, sets prices for that value, and converges toward a fair value exchange. Modern behavioral economics that shows that people are not heartless profit maximizers, but can be motivated by a sense of fairness and related aspects of reciprocity, altruism, and self-image to pay more than they have to (share their "value surplus"), when given a good reason. Supporting the quality journalism of The Post, for my own benefit, for the common good, and out of fairness, is just such a reason -- if given in terms that are specifically relevant to me and responsive to my concerns. Think of me as a patron, and make me want to be a patron. Computer-assisted dialog, and the growing ease of use and power of such dialogs to inform the process of understanding what I value, and to help me to recognize what value I have received. Engage me as a patron and show that you understand what I care about. Predictive analytics that can help The Post to shape both the service it offers me and the dialog it has with me in a way that gives me what I really care about, and makes me want to pay a fair price for it. I will be a patron if I feel what I patronize is worthwhile and respects my desires. How much should I pay? FairPay treats that as a matter for dialog. Only I can determine what I value, and what price I think fair for it. FairPay lets me pay what I think fair. ...But it does not stop there. Why should I pay fairly? FairPay enables The Post to suggest what I should pay, track what I do pay, understand why I think my price is fair, and tell me whether they agree it is fair. All of this is specific to what I read, how often, how much, for how long; whether I read it for business or pleasure; how affluent I am; and many other details. The Post can measure and report that to me, consider what I say about the value I perceive, and factor that into their suggested price. They can tell me they think I am being unfair, and limit what they offer me, or they can tell me that I am being generous and enrich what they offer me. If The Post plays this game well (mostly carrot, a little bit of stick), they can give me what I value, and motivate me to pay a fair price for it. These enablers and this value discovery engine inform a new invisible hand, one that can entice readers to happily pay a fair price for the content they consume. It gives the reader the power to set a price they are comfortable with, but gives the publisher the power to nudge that to a level the publisher is also comfortable with over time (or to cut back on what is offered). That new dynamic balances my goals and The Post's. The Post can gamble on my fairness for a time, to see if am willing to be a patron. (Doing so costs them almost nothing.) If not, it can leave me to deal with a conventional paywall subscription, or to fend for myself. If I am willing to be a patron, The Post can serve me at whatever level I justify that I pay fairly for. "We will need to invent..."
"...which means we will need to experiment"
...FairPay is a method for experimentation in the form of structured dialog with readers, for dynamically learning what they value, at what price, and for guiding the Post's adaptation to provide it. "Our touchstone will be readers, understanding what they care about .... and working backwards from there"
...that is the touchstone of FairPay, turning the invisible hand to drive just that, in a new kind of emergent pricing process. I was pleased to present at two sessions in Zuora's Accelerate East conference in NYC on October 16. 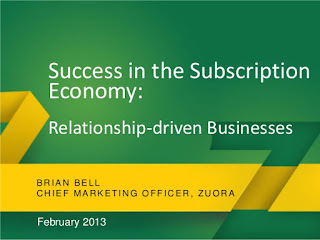 As noted elsewhere on this blog, Zuora is a company that is driving what they have termed "The Subscription Economy," and provide an important role as thought leader in this rapidly growing space. The event was very stimulating and well attended. Here are the two sessions I spoke at. Topics/Abstract: Learn strategies for accelerating your marketing levers to drive business growth and hear best practices first-hand from businesses that have done it. Learn how to use pricing and packaging as a tool to increase customer acquisition, value per customer and reduce churn.